Europe I think it is safe to say is leading much of the western world in terms of installing solar PV panels. 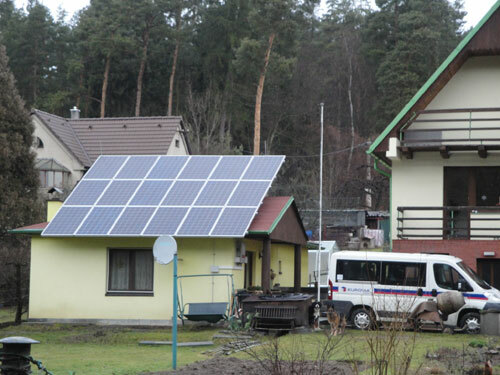 On a recent trip to the former communist country of the Czech Republic, I came across many examples of solar in use. Even in some very small towns and villages, solar electricity is making a big impact and will be helping out families and businesses for a very long time. Of course solar is always a financial obstacle, but even in countries where one might not expect to find solar power, it can still make sense. The cost of electricity in much of Europe is far more expensive when compared to many parts of the United States. This for sure makes the solar equation much more palatable and with the economic incentives from local and federal governments, solar panel installations are increasing. 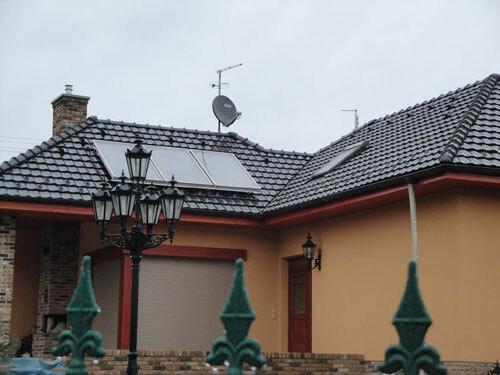 To the left is a great example of a local village home in Tynec, Czech Republic which is making the most out of their 18 panel solar system. 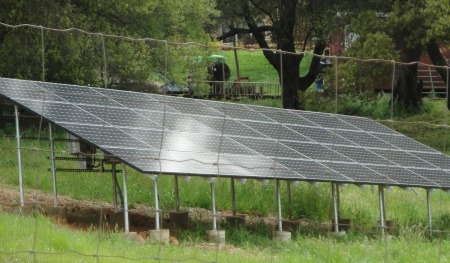 This system is approximately a 3.2 kw photovoltaic system, and in the summer months it can produce nearly 400 kwh of electricity which is over $100 in electricity in USD prices. The solar panels are expected to last with great electricity output for another 24 years, and probably will be working well even at that future date. This family never needs to clean them as it rains on and off all year long, and with a fully unobstructed view towards the sun, and with a proper solar angle, this system is set to go for a long time. To the left is another fine example of solar in use in Europe. This is a simple 3 panel solar hot water system that provides piping hot water for this family house all throughout the year. Solar hot water systems still are very economical, and much cheaper to order and install compared to PV solar, and they really help out with reducing the costs of heating water. For anybody who is even remotely interested in solar, you should definitely figure out if your roof is a good candidate for solar hot water and start the planning phases now instead of later. Today, let’s all try to figure out how much electricity is being produced from a large photovoltaic solar system. This particular system is located in an area where there are a few different factors taking place. First, you can see from the picture that the sunlight is not clear, and that there is quite a bit of fog or clouds in-between the sun and the PV. 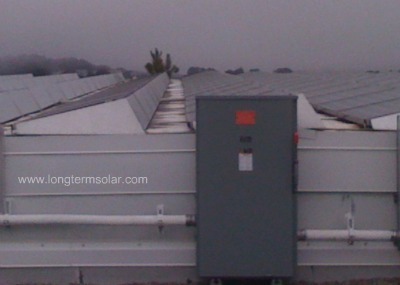 Also, you can notice that all of the panels are mounted at an angle towards the sun. In order to figure out how many kilo watt hours of electricity are produced by this system, we need to understand some of the variables. In other words, we need to know the variables that are part of the electricity output equation. Third: OK, now we need to keep the equation moving forward by determining how many kwh (kilo watt hours) this system is going to produce. We can do that by multiplying the larger watt figure of the system which was 77,220 watts, to make this easier, we will turn that into 77.22 kW for a system size. So, take the 77.20 kWh * 5 hours per day and that will give: 386.1 kwh/day. 386.1 kwh – 58 kwh= 328.1 kwh produced in DC. If you have any questions, please leave a comment below and I will respond to you right away. For the common American family who is getting ready for the big energy using months of the year, an extra load of electricity being provided by solar panels would be a much needed boost, and especially if it was a considerable amount of power like 250 KWH every month. What would the financial benefit be for saving 250 KWH per month on your electric bill from solar power? The answer is going to depend on the type of electric bill you are set on. If you have a flat rate plan per kilo watt hour, you can simply multiply the 250 kwh’s by the price you pay for each kwh from your utility. That generally is going to be equal to about $0.15/kwh for an average. The number does vary state by state, but that would equal about $37.50 in savings each month on your electric bill. This may not sound like tons of money, but it can sure start to add up quickly. For example, if you begin to factor in the reality that electricity prices are expected to continually rise in the coming years and pretty much forever, this savings will also continue to grow. 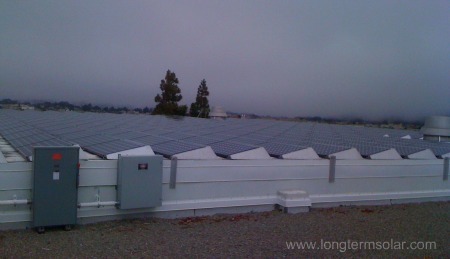 The 250 kwh solar production numbers are not always going to remain constant throughout the year. What is most typical is that when the months of June, July, August, and September come around, the energy production numbers tend to increase because there are more sunlight hours. 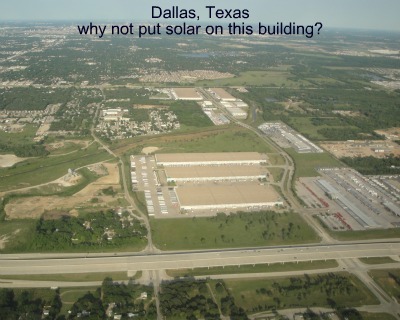 This is almost always the case with anybody who uses solar power in the United States.